Trudging along in the family RV is one way to criss-cross America. Sure, there are plenty of fun memories to be had, but in comparison to going from New York to Los Angeles in a Lamborghini with Paris Hilton, the Winnebago’s pretty lame. Embarking from Manhattan on July 21, Bullrun 2006 is an eight-day rolling party across the United States that brings together exotic cars and a celebrity-strewn cast of drivers with a simple goal to party, drive and enjoy—tough goal. This year, as in the past, Bullrunners will be commanding a fleet of wild, often high-performance cars. Andretti will be piloting an Audi RS 4, while Beckford will take the wheel of an Audi A6 Avant. 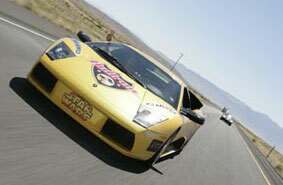 Last year, Rodman and Christensen drove Lamborghinis—the latter as a member of Team Star Wars. Entry fees are generally $14,000, which covers two drivers, luxurious accommodations for seven nights, all meals and parties. For more information, visit www.bullrun.com.